When I was in college, I suffered from frequent urinary tract infections. I pretty much always had one and it was horrible. I kept going to the doctor and getting prescribed antibiotics for them and it was a huge pain. Finally, my body stopped getting them after about 3 years of constant issues. I am so thankful that I no longer have these issues because it was annoying and painful. When someone tells me that they have a UTI, I can definitely relate. 1. Drink lots of water- The main times that I noticed UTI issues was when I was dehydrated. In college, a couple of beverages may have been consumed here and there that were dehydrating (I'm talking about alcohol here) which made it very difficult on my UTI issues. I noticed that when I stayed well hydrated, I had a lot less issues than when I was dehydrated. 2. Limit caffeine- For me personally, I used to be extremely sensitive to caffeine and even 1/2 cup of coffee would set off UTI issues for me. At that time, I was not able to have any caffeine sadly. Thank goodness I have grown out of that. 3. Use cranberries to maintain urinary tract health- Cranberry juice, cranberries, cranberry pills and more can help with urinary tract health. In fact, I did a huge paper on this topic during my undergrad in Dietetics because it was of interest to me. My research showed that cranberries have substances that prevent infection-causing bacteria from sticking to the urinary tract walls. Awesome! I was recently sent some AZO Cranberry Gummies to try which can aide in maintaining urinary tract health. I used to take cranberry supplements years ago and was excited to try these for people who still suffer from UTI issues. These are quite good! They are mixed berry flavor and taste more like a candy than medicine. They are sweet and not tart like cranberries. They help to flush the urinary tract. Two of these gummies are equal to a 10 oz glass of cranberry juice. You can find this at CVS, Rite-Aid, Walgreens, Walmart and more. Retail price depends on the package size and ranges from $6.50-$9.99. This brand also has other products for urinary tract health. 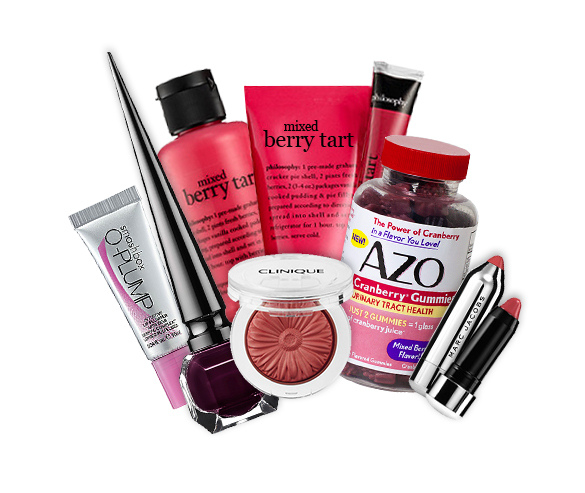 AZO is having an AZO Products Berry Beauty Sweepstakes on the AZO Products Facebook page. *These statements have not been evaluated by the Food and Drug Administration. This products is not intended to diagnose, treat, cure or prevent any disease. AZO Cranberry® used under license by i-Health, Inc. Pacran® is a trademark of Naturex. I heard it's good to eat yogurt is that true too?